In African mythology, the squirrel is often portrayed as a frugal and prudent farmer. In reality, they do store food away for future needs, but they are considered pests by farmers for stealing corn. 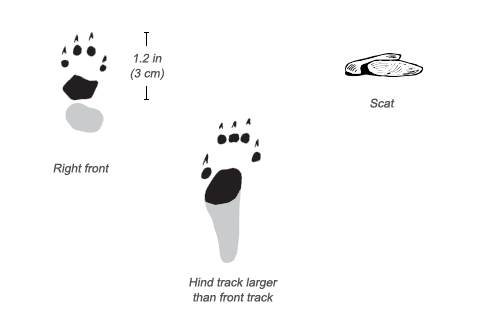 Tracks: Look like other small rodent tracks; claws show; gray area indicates size of track if the whole foot leaves a print. Are striped ground squirrels rodents? No, they are related to meerkats. No, they are related to hyraxes. Striped ground squirrels are rodents. They belong to the family Sciuridae in the order Rodentia. Squirrels live mostly alone, although they occasionally live in small family groups. When two adults meet while foraging, they’ll briefly touch noses and then continue on their way. Although there may be displays of dominance or submission, aggressive behavior is rare. 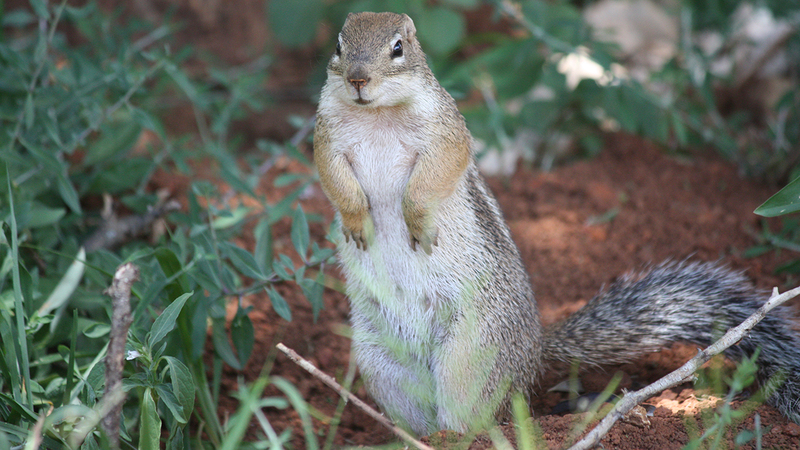 Striped ground squirrels communicate distress and alarm with loud calls, often while running to their burrows. They also communicate by rubbing scent glands in their cheeks on objects to release a smell. As their name suggests, striped ground squirrels spend most of their time on the ground rather than in trees. They are active in daytime, though move to shady spots or burrows during the hottest part of the day. When they get very hot, they lie with their bellies pressed against cool sand or stone to cool off. They either dig their own burrows or find rocky niches, crevices made by tree roots, or termite mounds. They select a different burrow each night and, despite their solitary nature, will tolerate other striped ground squirrels visiting their burrow. Striped ground squirrels are listed as a species of lower risk, because there are so many of them in such a large range. Striped ground squirrels live in a wide band south of the Sahara from the Atlantic coast east to Ethiopia and as far south as Kenya and northern Congo. 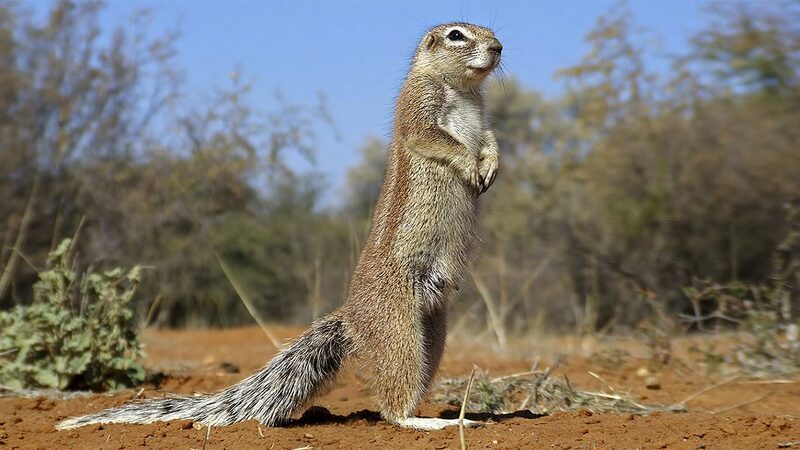 These squirrels live in a variety of habitats: savannas, scrublands, rocky areas, and semi-desert environs. They avoid dense forests, but will live in clearings and along the edges of rain forests. Striped ground squirrels eat mainly vegetation, including leaves, roots, seeds, fruits, flowers, and nuts. Occasionally, they will eat insects—especially termites—and sometimes meat. These squirrels look for food and eat alone rather than with other squirrels. They hoard food by burying it underground, though are careful to hide it far from the entrances to their burrows. Scientists don’t know much about the reproduction of striped ground squirrels other than that they probably breed for the first time before they are a year old. Litters typically include four young, but can be as small as two or as large as five. Young squirrels play with each other and with adults. Many animals will eat a squirrel. The trick is to catch it. Hawks, eagles, puff adders, jackals, servals, and wildcats are major squirrel predators. The striped ground squirrel shares its habitat with a similar-looking cousin, the unstriped ground squirrel. 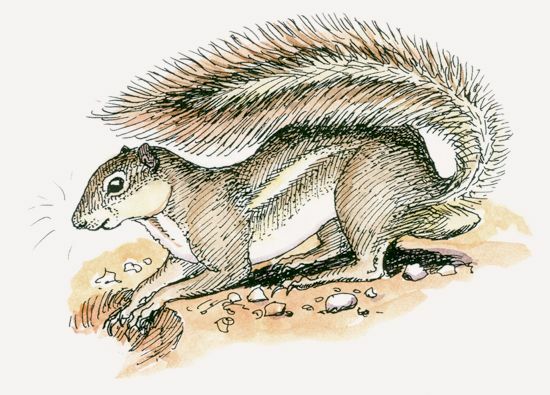 As the name suggests, this squirrel lacks distinctive side stripes. The two species share burrows, though scientists think that striped ground squirrels—the larger and more aggressive of the two—is replacing unstriped ground squirrels in some places. Like many squirrel species, striped ground squirrels are very common—and also difficult to count. Striped ground squirrels dig their own burrows, which consist of a central chamber with about three separate entrance tunnels.